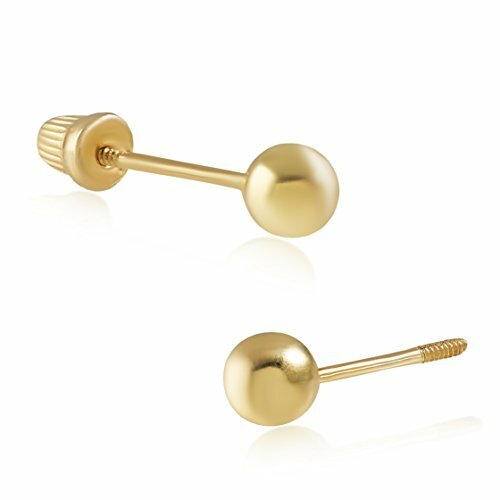 Add a contemporary edge to your look with these stylish bezel stud earrings. Not only is crafting jewelry an extremely creative art form, but so is wearing it! Are you looking for a fine piece of jewelry with a pleasing aesthetic that has a lot of meaning to you that you'll store in a safe place? Is it a piece that you'd like to wear on special occasions, or even regularly? Do you want a piece of jewelry that you helped personally design yourself and that you know will last forever in your jewelry collection? This High-end jewelry made with 14k solid gold and is carefully crafted with a high attention to design and detail and most importantly reflects you. This is Unique jewelry and denotes personality and expression, it tells a story, and it is a small way for you to display your individuality. give yourself confidence and make your inner self-shine and click add to cart now!!! CLASSIC DESIGN:Simple 14k Yellow Gold Ball Earrings. Smooth and comfortable to wear. Great starter earrings for women and girls. Suitable for any kinds of occassions: as daily jewelry,working jewelry or jewelry for sport and party. Satisfaction Guarantee: All Balluccitoosi Ball stud earrings provide 30-day return policy,and lifetime customer service.If you have any problems on our products,please feel free to contact us at any time. If you have any questions about this product by balluccitoosi, contact us by completing and submitting the form below. If you are looking for a specif part number, please include it with your message.